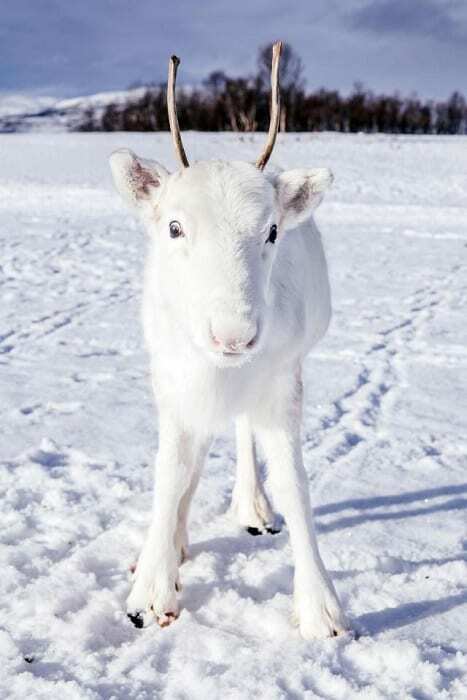 Right in time for Christmas, Norway has received an amazing gift: a sighting of a rare, snowy-white baby reindeer. The calf was seen in the north of the country, walking into the forest with its mother. Unlike the baby, the mother reindeer was brown, like most reindeer. But her unusually colored little one was almost indistinguishable from the snow. Luckily, a photographer named Mads Nordsveen just happened to be in the area in time to catch a picture. Nordsveen was on a hike with a group of friends when they caught a glimpse of the striking animal. 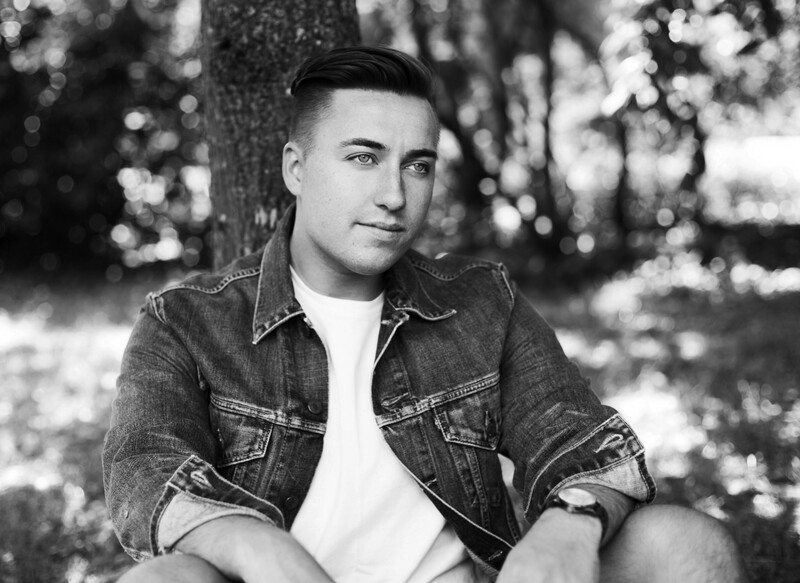 The 24-year-old was deeply touched by his encounter with the beautiful animal and is extremely happy to have been able to catch it in a photo. Most baby reindeer are born in early summer, usually in May, so this little guy is only a few months old. 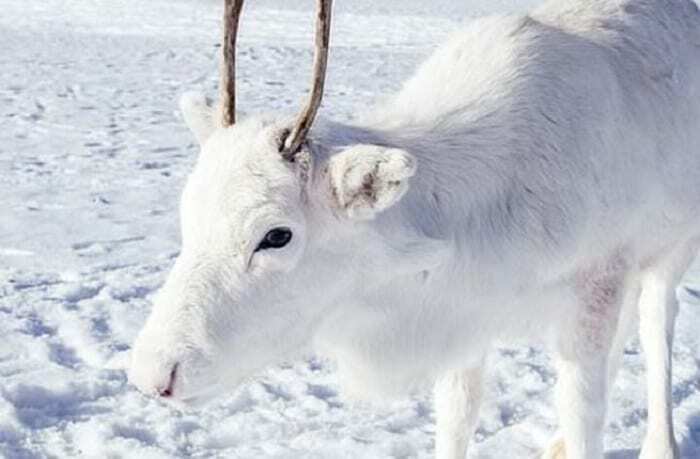 It’s rare to see reindeer that are white in color. Their coloring is due to a genetic mutation, but it’s not albinism. They still have regular layers of pigment in their eyes and antlers. It’s just their fur that is totally colorless, making them an amazing sight in the snows of the Norwegian winter. Having blinding-white fur might be a detriment to some animals. 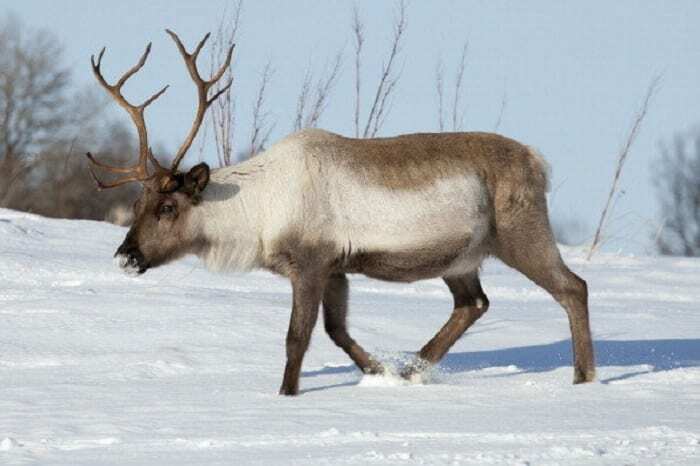 To reindeer, who spend their lives in the snowy arctic and subarctic regions of Europe, Asia, and North America, it’s perfect for hiding from hunters and predators. 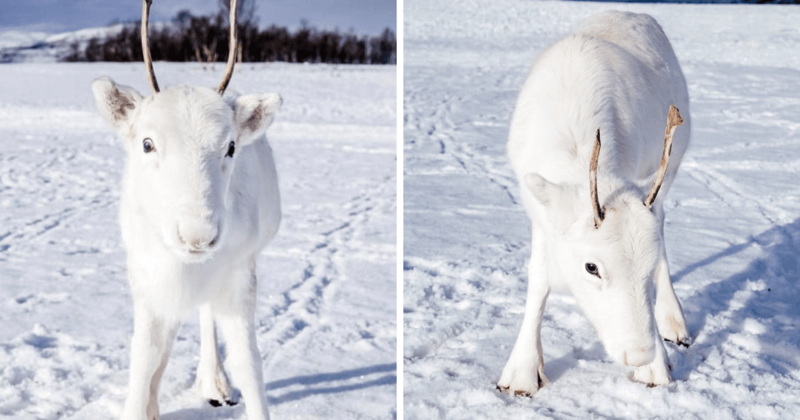 According to the Sami people of Scandinavia, spotting a white reindeer is good luck. Well, technically you have to see one at the same time as the sun and the moon. That seems like a long shot, but there’s no doubt these creatures are uniquely beautiful. People around the internet were stunned by Nordsveen’s photos. They joked that the friendly little animal was happy to pose for his photo shoot. Whether that’s true, he does seem unusually cooperative. 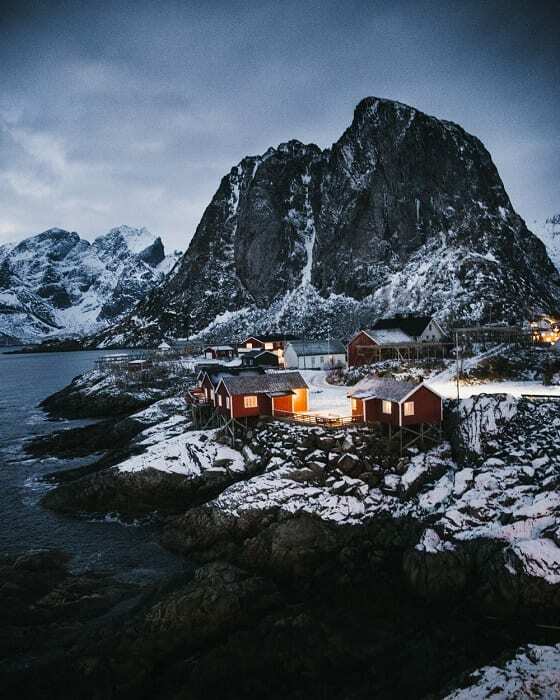 Although Nordsveen didn’t specify exactly where he spotted the reindeer and his mother, he also recently posted a picture from the region of Hamnøy, Lofoten Islands, Norway. Hamnøy is a picturesque fishing village, surrounded by craggy seaside cliffs covered in snow. Nowadays, it’s a popular tourist destination that has all sorts of modern amenities with the look of a long-ago fairy tale. But it’s cold there, pretty much the whole year, and it rarely gets light between December and February. Apparently, if you want to hit the tiny village up in May, you can catch an annual jazz festival, which seems a little anachronistic. But despite all the modern amenities and events, it might still be easy to believe that this is a land where reindeer roam through the snow. Frankly, it looks like a place that could serve as inspiration — or even a movie set — for a story set in the North Pole. No wonder reindeer abound. “Abound” might be too strong a word, though. But the decline also varies between populations and regions. 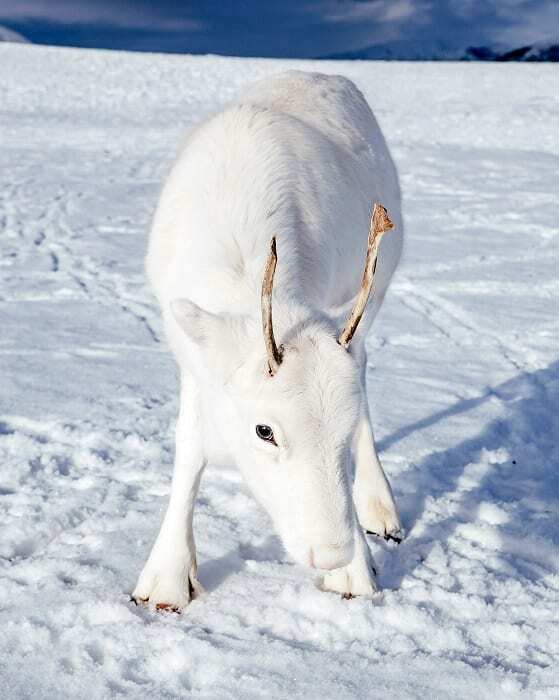 Reindeer depend significantly on migration, so their population is prone to oscillate with their surroundings. But they’re also falling prey to hunters and other factors. Reindeer are only native to a few places around the globe. They can be found in certain regions of Europe, Siberia, and North America. Their rarity in most parts of the world makes encountering one a unique experience. Nordsveen said he hopes that he and his friend will meet again someday. It is really astonishing that a wild animal who probably has had very little contact with humans was so friendly and uninhibited. When his mother came to pick him up and bring him home, at last, she didn’t seem worried about the presence of humans, either. Nordsveen said his new friend simply turned and followed his mother into the woods. He doesn’t know if they’ll meet again. But according to Swedish folklore, the Oslo photographer might have some good luck coming his way.